Sanitair Australia’s CEO holds Qualifications in HVAC and Engineering and is an Affiliate Member of AIRAH (the Australian Institute of Refrigeration, Air Conditioning and Heating). Craig has a Masters Degree in Business, is a Fellow of the Australian Institute of Management, Affiliate Member of The Australian Marketing Institute and is a Certified Master Coach of the ICC (International Coaching Council). A multiple business award winner, Craig’s vast business and coaching experience together with his education not only guide the day to day operations but the overall strategic direction of Sanitair. Craig heads up a talented team that are all committed to ensuring the continued delivery of Sanitair’s Award winning service and outstanding customer service. 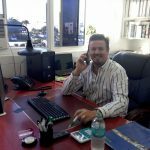 Passionate about improving indoor air quality and reducing the carbon footprint of air conditioning in Australia, Craig is personally involved in the education and training of every Sanitair technician. Juliana manages the day to day administration, project management and compliance for Sanitair. She holds a Graduate Diploma in Accounting and is currently studying for her Masters in Professional Accounting (MPA). Juliana has over 15 years’ experience in front office, reception, bookkeeping administration, project management and customer service. Keri joined Sanitair in 2015 as a receptionist and progressed with the growth of Sanitair to her current role as Office Manager. Keri’s many years as a senior administrator in the music and medical industry has equipped her with necessary skills for her role. When Keri is not in the office she can be found travelling the world supporting her daughter an up and coming pro surfer. Keisha is the first point of contact for Sanitair. Keisha joined the team in January 2019 and is currently completing CertIV in Business. 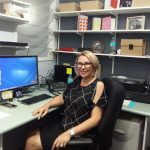 Keisha has 3 years office experience within the recruitment industry and previously worked for NovaSkill and Connect Northern Rivers. Keisha prides herself on delivering exceptional quality focused customer service. Sanitair have over 14 years’ experience specialising in Air Conditioning Cleaning and Sanitising servicing Australia wide. Sanitair are locally owned and operated businesses across Australia. Our team of HVAC Hygienists understand the importance of clean indoor air and use products that are Australian made, environmentally friendly and bio-degradable. We believe everyone deserves the right to clean indoor air. Sanitair pride ourselves on customer satisfaction and offer 12 month mould free guarantee on premium services. Sanitair was recommended through the lung transplant support group. Competitive price, thorough clean and great to deal with. This full clean & sanitise should be mandatory part of RTA bond cleaning. Disgusting what came out. Can’t thank you enough Gerry. Thank you for your feedback Chris and we are please that you are now not being exposed to potentially harmful pathogens from a contaminated air conditioner. We totally agree with you… air conditioning cleaning should be mandatory before a property is rented just like carpets and pest control. Unfortunately it can often be, ‘out of site out of mind’ and for uneducated property managers, they think air conditioners that look clean on the outside are clean on the inside, which is all too often not the case exposing new tenants and their families to mould, bacteria and allergens. We would recommend all new property tenant’s to inspect their air conditioners thoroughly and report and contamination immediately to their landlord or property manager for urgent professional remediation. If any tenant is unsure what they are looking for their local Sanitair technician will be happy to advise on inspection procedures. Very, very impressed. Greg did an awesome job. Our air con is now like a brand new unit. 🌟🌟🌟🌟🌟 service.